Nolan as a captain won these two a ridiculous amount of points, and Sterling also with 11 points stand along deemed to be a good pick. The White Walkers dropped vital points in their race to 1st place, with Steven Pienaar gaining a -1 point due to being sent off, as well as 5 of his players in his entire squad not participated in a game this week. With Manchester United playing away, and Chelsea being ahead in the league, this title clash will be an edgy one. And your picks in this game could change you from a loser to winner or vise-versa. The Merseyside Derby also gives another key game this week, in which this could be a fiery affair. So watch out for your Liverpool or Everton player getting a yellow card or possibly even a red one for this game. Unlucky for Blue Mountain State this week picking both Ivanovic and Torres (sent off against united) among an average team, with a Tevez captain gaining 12 points as a reprieve. One which based on reason results could prove to be an easy win for United, but you never know with Man United’s defensive issues of late it will be up to them to try and keep a clean sheet for once. QPR vs Norwich: could be a game where the tide turns even more so in Harry R's favour, I thing QPR will win this one, and Remy on song? 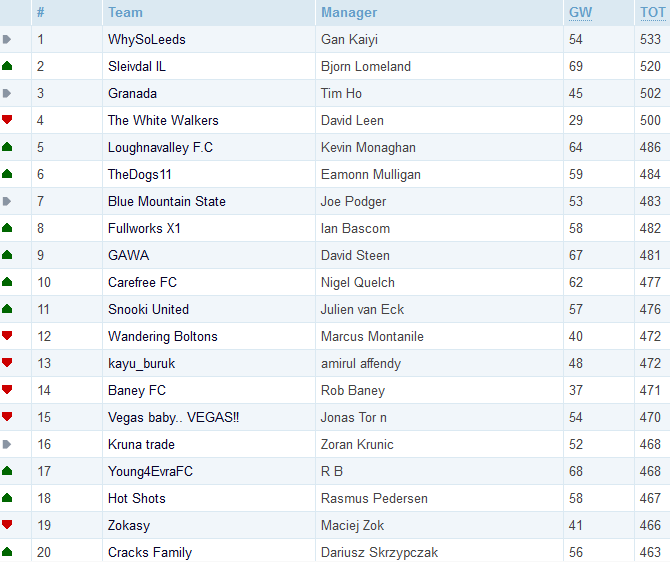 Despite the lack of updates, the final standings for the 2012/13 Fantasy Premier League are here! Just 285 points separate 1st place from 50th place, a very close competition for the year! 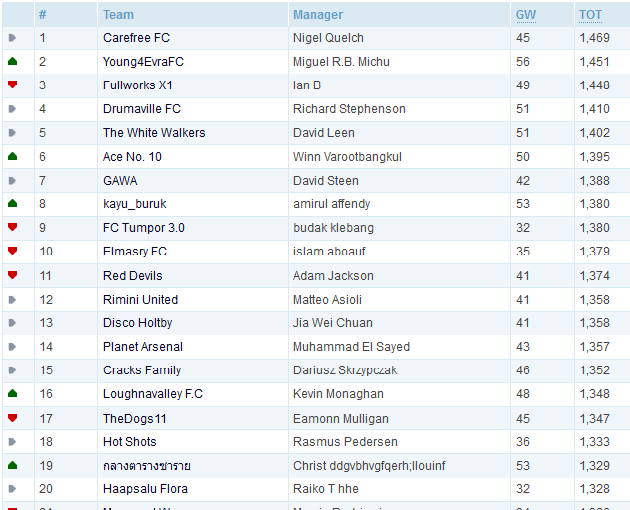 So Nigel Quelch finished top with Carefree FC, finishing with 2,326 points. Just 31 points behind Nigel is Ian B, getting 2,295 points with Fullworks X1. Then in third place is Budak Klebang, who was with FC Tumpor 3.0 and managed 2,263 points. A big congratulations to the top three. However, the standings were also measured at every quarter, so who came in the top 10 for each quarter? Bjorn Lomeland took the lead at the end of the first quarter, scoring 568 points with Sleivdal IL. Niguel Quelch scored the highest throughout the second quarter, getting a massive 600 points with Carefree FC. Ian B scored the highest throughout the third quarter, with Fullworks X1 scoring a brilliant 719 points! Nasreey Razali scored the highest throughout the fourth and final quarter, scoring 567 points with Sir Wayne Nasri. So that's the final standings. Congratulations to everyone, and a massive congratulations to the winner Nigel Quelch! You are reading "Fantasy Premier League 2012-2013".